Norm ‘Nomzee’ Maxwell on CBS Morning Show. CBS welcomed our artist, Norm ‘Nomzee’ Maxwell, to live paint and be interviewed about his upcoming exhibit ‘Voyage Through The Void’ which opens this Saturday, April 16th, 2016, 6-10p (rsvp@gallery38.com). Maxwell is an American Contemporary Artist based in Los Angeles. Maxwell’s signature style references a broad range of emotions, symbols and ancient traditions which manifest through a stream of the subconscious, creating a rich and diverse visual language that is uniquely his own. Norm painted Anchorman Garth Brooks who is also a fan of Norm’s work. 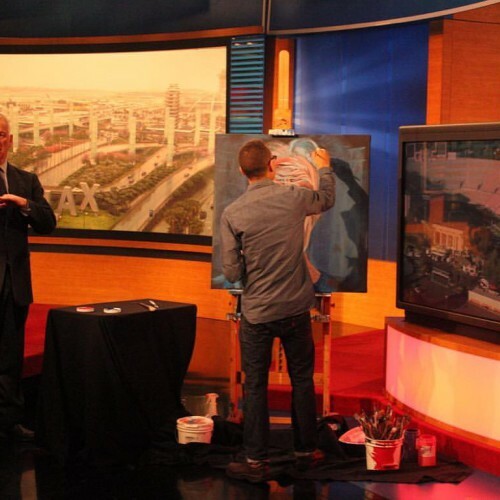 Garth and the CBS crew got a surprise once Norm finally revealed what he was painting, watch the full video, here.